Huba de Graaff (1959, the Netherlands) studied violin at the Sweelinck Conservatory, sonology in Utrecht and composition at the Royal Conservatory in the Hague with Gilius van Bergeijk, Louis Andriessen, Frederic Rzewski, Walter Zimmermann. 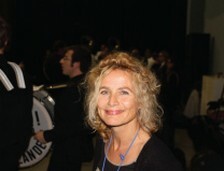 She played in several pop groups (Transister with Robert-Jan Stips and The Tapes). She has worked with computers from the very beginning (’80). The experimental opera for singing and moving loudspeakers ‘Lautsprecher Arnolt’ (2004) performed by Marien Jongewaard has toured succesfully for a long period. The Death of Poppaea (2006) and Diepvlees (2009) were even very positively received by the Dutch press. Recently she wrote an electronic piece for the 25th jubilee of the Mondriaan String Quartet, and a new opera about the origins of singing: the Apera, to be premiered in october. No one has ever seriously composed for KORG MS-20, JUNO 60 or Yamaha CS15 and all that other pre-midi-pre-computer-prehistoric electronic synthesizers. These analogue instruments from the early eighties were not created to be used in studios, but they were meant to be played on stage, mostly by pop-musicians. The pop-musicians all over the world were playing with their new musical toys: the amazing new world of unknown sound possibilities. One big euphoria. It felt like you could make any sound imaginable; create any conceivable ‘atmosphere’. The MS-20 and JUNO-60 never reached the high-brow-institutes. Because of the obsession with total control of ALL parameters in serial music, composers thought about commercial synths as being too primitive and not exactly controllable (which was a little bit true, but the same can be said about the violoncello or the organ or any classical instrument). But while classical instruments are still fully available, the evolutionary ancestors of the electronic music of today disappeared completely, due to the incredibly fast technological developments. Both Huba and LP duo share their love for these antiquités with their specific sound possibilities and techniques.